I woke up for the first time in Positano with the sun peeping through the shades of my balcony. It was early but I could already tell it was going to be a beautiful morning. We got ourselves together and packed up what I thought I'd need for the day: hand sanitizer, sunglasses, notebook and pen, camera, and duh, a super-Italiano type scarf. We went down to the terrace of our hotel where breakfast is served and sat at a little iron table overlooking the sea. Breakfast in most of Italy is relatively small, not your typical eggs and bacon type of deal. A cappuccino, toasted french bread, and yogurt is the norm, which is perfect for me because that's what I usually eat at home anyway, sans the super-cute fluffy cappuccino and substitute in a Starbucks skinny latte. There is also usually cereal served with whole milk, too rich for my little stomach, fresh fruit, and sometimes meats and cheeses. At our hotel, Mama Maria even had some tasty fruit tarts and breakfast cakes set out as well. But a heaping plate of pancakes and sausage is not something you would be able to find in little Positano, let alone most of Italy. After a quick morning bite, we headed down the steep hike to the steel colored beach, where we were to meet our boat that would take us to Capri. We had gotten to the dock a little early so we decided to meander for a little and take in the beautiful morning sun. Around mid-morning we finally made it on the sleek speedboat and headed off in the direction of Capri. Before docking up, our captain, Paolo, drove us full circle around the island so that we could get a better look at the incredible rock formations built into the side of the coast. 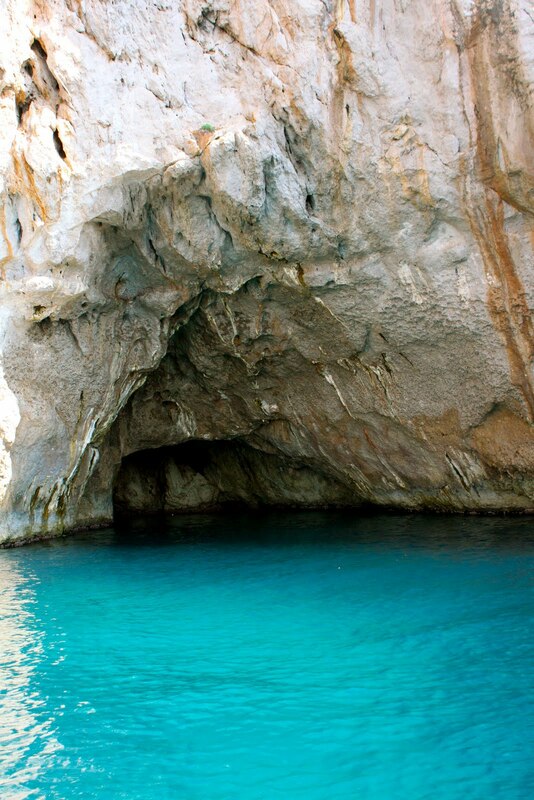 He took us by all the different grottos, or caves, that speckle the Capri shore line. We saw the green grotto, the white grotto, a similar grotto to the 'blue grotto', and several other unique caves and pristine water pools. Once our little tour of the island was over, we docked next to some pretty impressive yachts and pretended to be playing with the best, contenders in our own right. We met our tour guide, that for the life of me I cannot remember his name, but he was sweet as he could be and tan as a Ferragamo leather bag. 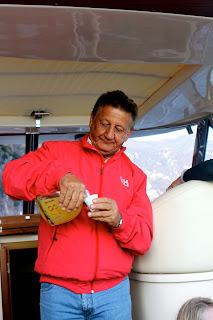 He explained to us that there are two main towns on the island, Capri and Anacapri. Capri is the larger of the two towns though the entire population only boasts a little over 12,000. The tourists boat in by the thousands each day during the high season months of the summer, but the island virtually shuts down for the winter time and there is little to no transportation to and from the shores of Italy. So Ferragamo (my nickname for our driver) piled four of us into what they call a Capri Car. A special taxi developed with one of the major European car companies to be used specifically for travel on the island. It looks kind of like the result if you bred a boxy white SUV with a small convertible sedan; good for sight seeing but not so amazing for safety, especially on those winding roads and the seemingly careless drivers. Ferragamo tells us that they haven't had an accident in Capri in something like 80 years. I find this incredibly hard to believe and of course I challenge his judgment, in which case he corrects himself and replies, "well only between the natives... the tourists wreck all the time, no worry!" Ferragamo takes us straight up to the main square in Anacapri and says he'll come get us in a few hours. So Mom and I and another cute mother/daughter pair decided to grab a bite. One of the best pieces of advice I can give you about choosing a restaurant abroad, especially in Italy, is not to go for an easy target, a restaurant situated right in the middle of the tourist mecca. While they may boast "no frozen food" and "the best panini's this side of the Amalfi", sometimes the best eats are the little gems just outside the tourist fault lines. But really, when in doubt, ask a local! And, try your hardest to not sound soooo American by using me scuzzi and grazie when appropriate. If not, they'll probably just send you right back to the typical traps. We were smart to ask Ferragamo and he sent us "a couple of meters just down the road on the left" to a little restaurant called Le Arcate. Though we were a little early for typical lunchers, we went ahead inside and enjoyed a little peace and quiet. We took our menus and almost immediately it was a unanimous vote for some pizza. Pizza, as it so happens, is typically associated with Naples, but naturally because of the proximity, just about any of the costal towns along the Amalfi has some pretty fantastic pizza. I, being reminiscent of my last summer spent in Florence, ordered mozzarella con salame, or cheese with salami. My mother got rucola con formaggio e pomodoro, or arugula with cheese and tomatoes. The mother/daughter pair also ordered a salami pizza as well as a vegetable medley combination. I think its those rarely cleaned old brick ovens and open fires that make me a slave to Italian pizza and why its also so difficult to recreate. I had to go to pizza rehab after returning to the states because of my withdraws from "the good stuff". After a nice long lunch, the place was packed and we were already in on the secret why. Ferragamo had also already told us of some interesting sites to see in Anacapri and we got right to them. We decided to first tackle the terrifying looking chair lift that takes you straight up to the highest point on the island, Monte Solare. This thing seriously looked like the ride from H-E double hockey sticks, but we decided to be fearless and give it a try. You have to stand and wait for this little seat, which looks like a rigged school desk, to come up behind you (which I don't like the sound of that anyway) and you kind plop right in before it immediately wafts you up into the air. However, once your in, its the most peaceful ride to the top. I was expecting my stomach to be executing some kind of gymnastics routine inside me, but I was quite content with the sun, the view, and the quiet. Once at the top, there is the most unforgettable view accompanied by a cute little cafe and what looks like some kind of room built for events. I'm thinking to myself, "how cool would it be if you got married up here? ", but that quickly changed to "how in the world could I convince grandma to get on the chairlift? "; probably not the greatest of ideas. We decided to grab a couple of soothing cappuccinos and sit in a couple of lounge chairs they had set up along the terrace, but not before we made sure to capture the view. After heading back down to Anacapri, we stopped at the Casa Rossa, which is a little villa that was owned by the American Colonel, John Cay H. Mackowen. It is now home to rich artwork, mainly paintings, done of the island by some well-known artists and some not so known native creators. The Casa Rossa is also home to 3 Roman statues found in the blue grotto in the mid 1960s and early 70s. 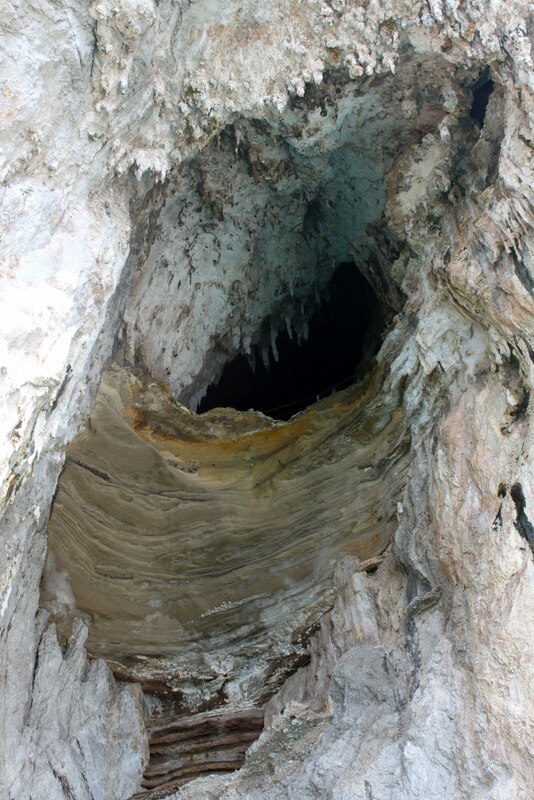 Divers discovered the statues and 4 other bases, which means that other statues are still yet to be discovered somewhere on the bottom of the cave. Between 27 and 37AD, the emperor Tiberius relocated the capital of Rome to the island and used the blue grotto as a private swimming pool. It is likely that he had the statues placed there for one reason or another. We then headed to the little church in Anacapri's center called Chiesa di San Michele. It's not uncommon that when you are abroad, particularly in Italy, the stigma develops that once you've seen one church, you've pretty much "seen them all". 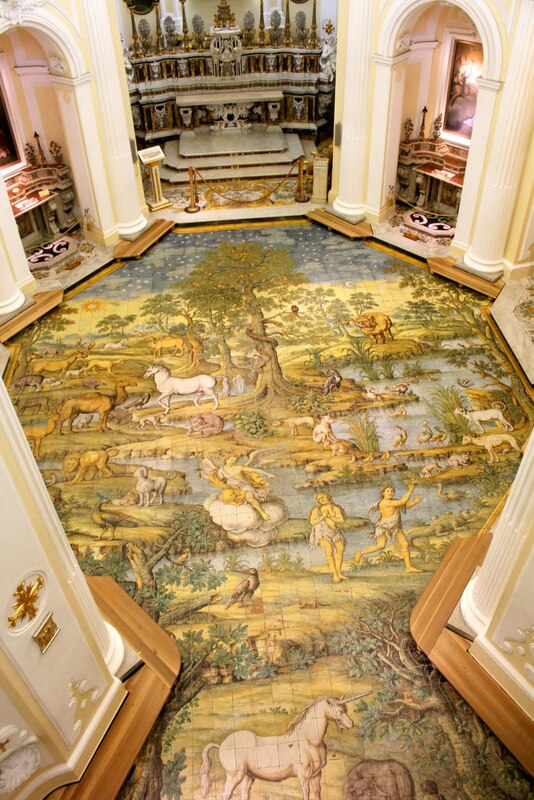 But, I have to say this little baroque church definitely blew me away with it's intricate painted tile flooring, which depicts the story of Adam and Eve. It was about time to head back down the drive to main city of Capri and Ferragamo was patiently waiting for us. On our drive down, he showed us some of the famous property of the island like Sofia Lauren's old home, Versace's mansion, and of course the house of Ferragamo! Once in Capri's city center, our driver told us of the most famous gelato shop called Buonocore. I was so eager to get my hands on an ice-cold scoop and by the look of the line down the street, I knew he'd sent us to the right place. The smell of fresh waffle cones drifted all the way from the shop to my nose and I could see that they were making them fresh to order. My mom decided on a strawberry and chocolate combo and like mother like daughter, I got the same thing. By far the most delectable cone of gelato or ice cream I have ever eaten (the exception being a heaping scoop of "cookies" from across the Arno in Florence, but I always got that in a cup). We ate and shopped the expensive fashion houses that line the streets of Capri. 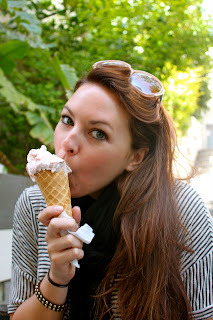 I tried on a couple of dresses way outside of my price range and was thankful for the ice cream because it made me feel on the plump side enough to discourage any over-buying. By the time we made it back to the main square it was time to say goodbye to Ferragamo and the beautiful island of Capri. 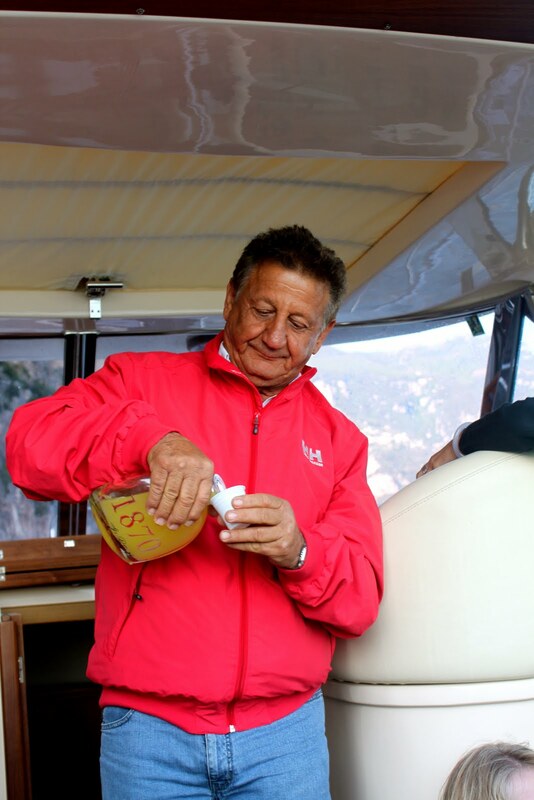 "homemade" lemoncello for the ride back! By the time we made it back to Positano, a real dinner seemed absolutely impossible to sit through. So, several of us from the group decided to go back to Vini & Panini (the little deli from Day 2) and buy some snacks. Giovanni, in perfect Italian and some broken English, helped us with some provolone di monaco, fresh strawberries, oil and vinegar, 2 types of salami, and some leftover bread he had on hand. When we got back to our little terrace at Hotel California the sun had already started to dip down below the sea. We got out a welcome bottle of wine the staff at Cooking Vacations had given to us and let the lights of Positano bring us to a state of relaxation.